The typical protein intake among bodybuilders and fitness fanatics consists of a steady rotation of egg whites, chicken breasts, protein powder, and the occasional meal of red meat. If this sounds like your weekly grocery list, you’ve probably hit points when you can’t stand the sight of your meal. Before you throw away all your meal-prep containers, there’s an answer as close as your supermarket: seafood. 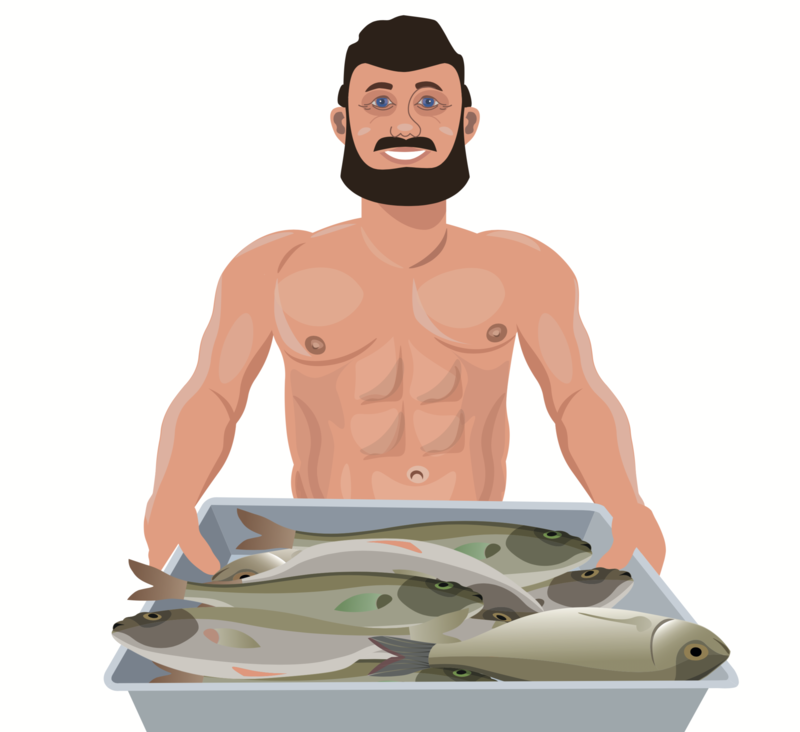 While bodybuilders often rely on varieties of whitefish during contest prep, there’s a sea of options to break the monotony. Many seafood choices yield impressive nutrient profiles, delivering a wide array of vitamins and minerals along with great macros when it comes to protein and healthy fats (or minimal fat for those in a cutting phase). In fact, fish is so good for you that Canada’s dietary recommendations state it should be consumed at least twice per week for the nutritional benefits it offers. With so many choices swimming around, here are our top catches of the day. Salmon delivers a decent serving of protein, offering 21 grams per 4-ounce serving. However, the most notable benefit to salmon is the high omega-3 content. Omega-3s are a healthy fat source that not only provide energy for the body but also can even help lower triglyceride levels. When it comes to food prep, salmon is great baked in the oven or sautéed in a pan, or you can get fancy and grill it on a wooden plank on your barbecue in about 30 minutes. These mollusks are a great option for their macro breakdown. Yielding 20 grams of protein in a 3-ounce serving (clocking in at a mere 95 calories), they’re also a great source of magnesium and potassium, important minerals for controlling blood pressure. Outside of their nutritional profile, scallops can be ready to eat in a mere five minutes in a pan and will take on any flavour you add because of their naturally bland taste. You can’t ask for much more than a quick and easy protein source that’s loaded with health benefits. This tropical fish is a favourite among many of the fitness crowd, and for good reason. A very lean protein option, this fish contains only 1 gram of fat but 20 grams of protein in a 4-ounce serving—a pretty stellar ratio. As an added bonus for those who feel less than skilled in the kitchen, this fish holds up to almost any cooking method, making it foolproof for amateur chefs. From standard baking with herbs sprinkled on top to en papillote (don’t worry, that simply means cooking it in a parchment paper or foil packet) or simply sautéing it with veggies, this fish makes an all-around great meal. While an acquired taste, these little guys are chock-full of amazing benefits. This oily fish is rich in essential vitamins and loaded with protein—a 4-ounce serving delivers 23 grams of protein! Their high omega-3 content makes them beneficial for reducing inflammation and helping fight against heart disease. They’re also incredibly low cost. While numerous healthy seafood options are available, look for “wild” rather than farmed. With the latter, the fish are kept in large, man-made pools or tanks, which are often overpopulated. Some claim they don’t taste as good, either. A secondary health concern with seafood is the mercury content, which is especially relevant for those who love albacore tuna. But that’s not the only swimmer affected; shark, swordfish, marlin, and orange roughy have been identified by Health Canada as fish that consumers should be aware of for their mercury content. If you’re a fan of these options, guidelines dictate a maximum consumption of 150 grams per week for most adults (less for specialized populations). Leaner seafood options can be relatively bland, which may sound like a negative feature, but is actually a bonus. With these foods, you can get creative and make every meal taste different simply by using different herbs and seasonings while cooking. Get more great content like this each month in the free Muscle Insider Newsletter. Sign up by clicking here.